I'm a 47 year old married (13 years) mom of a 10 year old. Currently I work part time at a nonprofit and at our local Y, but I'm looking to work completely in my desired field of fitness and sports. I also own a craft business where most of my items are geared toward women who are into sports and fitness. In what free time I have, I do the triathlon thing of swimming, biking, and running. I'm also a downhill skier. Right now I’m training for my second 70.3 in June. Last year I became a coach with a local bike shop and their Women on Wheels program. It’s a program that helps women become more confident on the bike and, I the process, made me more confident too. In general, I started very young. My husband bought me a cheap mountain bike when I was pregnant in 2004 because I had hopes of riding it to get back into shape after our son was born. That really didn't materialize into anything, but I did use that heavy bike to train for my first triathlon in 2010. I'd say that's when I really started getting more into biking. Triathlon training. 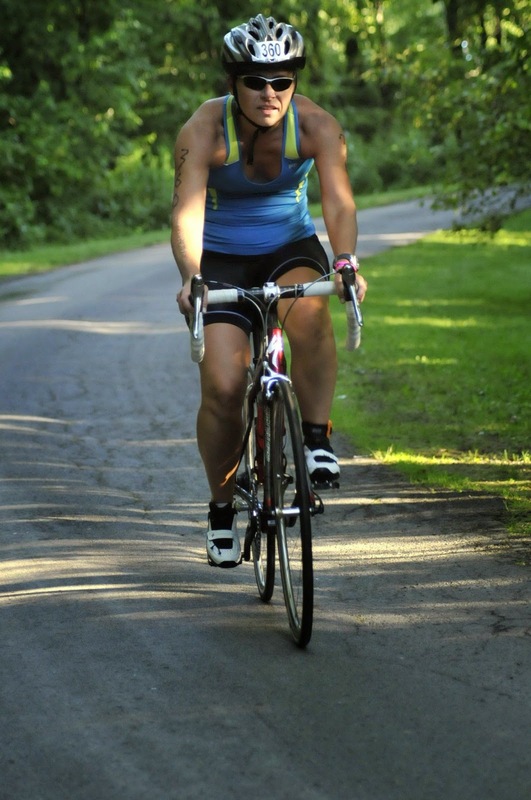 I completed my first (Iron Girl Syracuse) in 2010 and have been biking ever since. I've mostly biked in triathlons, but I did do my first road race this summer. This was the first time I experienced having to put a timing chip on my bike instead of my body. I had to zip tie it to my front fork, but when I did, I tied one of the spokes too. I was at my car and luckily someone at the car next to me noticed what I did and had something to cut it with. I was so embarrassed. My reason for competing is to challenge myself. I'm slow and will never win anything, so the first time I do a particular event, I just want to finish. All times after that are to beat my previous time. Right now I just do road biking. However, I'd like to try mountain biking and/or cyclocross events. Some new events have recently popped up locally that look fun and I like to try new things. I don't commute by bike. However I would love to. Right now I get my son on the bus in the morning, 5 minutes later I leave for work, I work for 6 hours, drive home, and then 5 minutes after getting home my son gets off the bus. I don't have any time to spare for biking to work. Maybe when he's older and he can let himself in and out of the bus, then biking might be an option. You became a coach at a local bike shop in your area, what inspired that? It’s interesting how I came to be a coach. I knew the bike shop co-owner (a female) just through Facebook. I'm a crafter, so I had actually reached out to her through FB to see what her shop did with old bike parts. I wanted to experiment with some parts to make jewelry, clocks, or anything else that I could find on Pinterest. While we were corresponding, I also asked her if she ever needed help with any of the shop's events. I have a master's in Sports Management and I'm not currently working in my field, so I thought maybe I could do some things with her. She eventually hired me as a contractor to help with their benefit ride to support Breast Cancer Awareness. Then out of the blue, she asked if I wanted to help coach with their Women on Wheels program. At first I thought she was crazy for asking me and figured I'd tell her no. In triathlon, the part that used to scare me the most was the biking. I always thought with swimming I could do the backstroke and with running I could walk. But with biking there is so much out of my control: flats, dropped chains, etc. But instead of saying no, I figured what better way to build my own confidence than to go help others who may be just starting out. I worry about safety too, so I knew our group rides would ease my stress about that. I also knew I'd learn a lot by just riding with the other, more experienced coaches. I was scared to death when I said yes, but it ended up being a great experience. I'm not an expert by any means, but really helped me with my own riding. What has been one of the most positive experiences you've had since coaching? On one of our last rides, we had just headed out and were only about 1.5 miles into our ride when one of the women got a flat. I was the closest coach, so I stopped to help her. I'm not fast at changing flats, but I was able to help her get it changed. Because this ride was late in the season, we were losing daylight pretty quickly, so instead of trying to catch up with the group, she decided she just wanted to head back to the car and head home. A couple days later she came to my day job with a thank you card and a gift for helping her. I thought it was so sweet that she took the time to seek me out to show her gratitude. 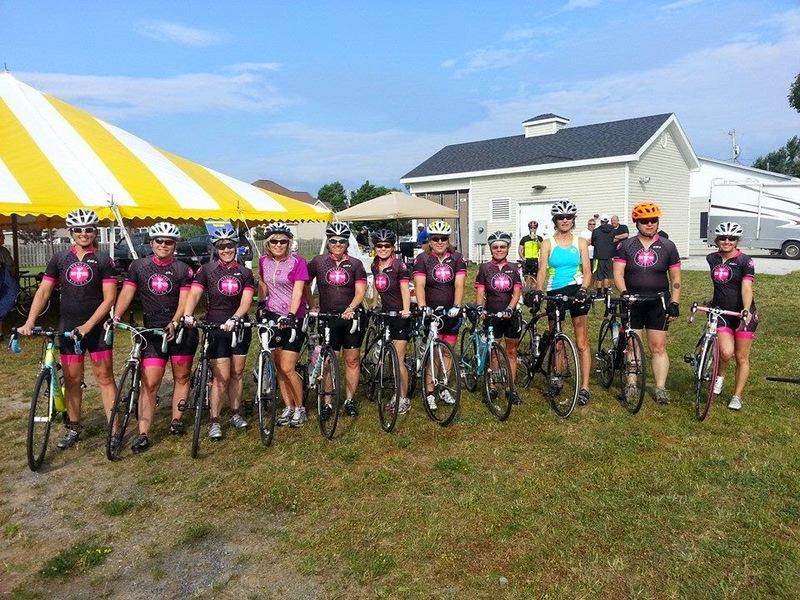 Women on Wheels (WOW) is an instructional, “no drop” cycling program run by Syracuse Bicycle. The first 15-20 minutes of each ride is dedicated to teaching more about how to be a more confident cyclist – flat repair, how to shift, pedaling efficiently, even what to wear when riding. Coaches ride alongside the participants as well, teaching them how to get the most enjoyment out of their time in the saddle. 2014 we had two different WOW groups. We offered Introductory WOW for the very beginner and Advanced WOW for the graduates of previous sessions or local experienced women riders looking for a great group ride experience. Advanced WOW will focus more on developing fitness and fine tuning skills as a rider. Ride distances gradually increased over the session to prepare participants for the 30 or 50-mile Spokerride. Both groups met on the same nights. Advanced WOW started riding right away and Beginner WOW had their pre-ride 20 minute lesson before heading out. Each session (a spring/summer and a summer/fall) lasted 10 weeks and included two 75-min cycling classes weekly and a cycling jersey. Entry into an end-of-session race/charity ride is encouraged, but not included in the class fee. Why should local women consider joining the program? The camaraderie was great. I liked knowing that I had two guaranteed rides to do each week. We had a pretty sweet bike jersey too! And I think the first lesson on how to change a flat was worth it right there. I love that it’s kind of a combo of running and driving in your car. Like running, you get the exposure to the elements and nature. I remember one ride this year we were riding past a strawberry farm. The smell of the berries was heavenly. Like driving in your car, you can travel pretty far and I saw scenery and roads I never knew existed in my community. I'm a crafter who specializes in making things that are geared toward people who are active. I make headbands, finisher's medals display racks, etched drinking glasses, and pretty much love all things crafty. My company, Tempo Creations, is named after my favorite type of training run: a tempo. I chose that because the tempo run is one that pushes you out of your comfort zone. I was scared to start my craft company, so I had to push myself out of my comfort zone to do it. As I said earlier, I started out riding on my big, heavy mountain bike. The Wed before my first Iron Girl, it was announced that Specialized was going to be at one of our local bike shops and they were going to loan out road bikes for the race, first come first serve...for FREE! I was unemployed at the time, so I showed up 90 min before the shop opened to make sure I got one. I know they say not to change anything right before a race, but I couldn't resist. After riding a road bike, I knew I had to get one of my own. The next spring, I bought a Trek Lexa which is one of their women's specialized bikes. I went to Syracuse Bicycle and tried a number of their bikes on one of their bike trainers and this one was great. When I did my first 70.3 in 2012, I had aero bars attached. I'm thinking about getting a new saddle this year. Up until this year, I only had worn tri shorts. When I got my coaching uniform, I got my first pair of bike shorts...what a difference! I didn't get paid to coach; however, I did get rewarded with store credit. At the end of the season I treated myself to a reflective jacket, foot warmers, and leg warmers. Due to cold temps, I haven't been out riding again to use these, so I'll have to keep you posted on how I like these. I don't love it, but in my part of the country (central NY state) I would recommend a bike trainer. More mental training than physical. I think what scared me was the mechanical stuff. Once I learned more about it, I have to say I became more confident. I think they also get really scared about falling especially with the clipless pedals. I always tell them just to accept the fact that they WILL fall. Your ego will be bruised more than your body. Once it happens, dust yourself off, get back on the bike, and ride on. You'll see that you're tougher than you realize. I think a lot of women get intimidated riding with men, so more groups like WOW and more women only races could bring on a change. I know having Iron Girl come to Syracuse made our triathlon club explode, so I think any event where its women only would really help. Just knowing that I've been there and I want to let them know I was scared too, but look at me now.